South of Stuttgart the town of Nürtingen hosts a fairly new brewpub which is located in the premises of an old slaughterhouse called the Schlachthof Bräu. The full address is Mühlstrasse 15, 72622 Nürtingen, Tel: 07022 939571 Fax: 07022 939572. Open from 11:00 to 01:00 Monday to Saturday and from 10:00 to 24:00 Sundays and holidays. Some of the old tools of the slaughtering trade can be seen hanging on the walls which is rather gruesome but otherwise the brewpub is a pleasant place and the service is quick and friendly. 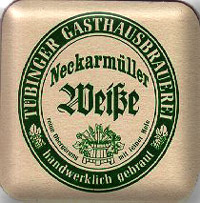 The beer range only includes a classic new German brewery style Pils or Weizen. Both are pleasant but taste the same as a dozen other brewpub offerings who all appear to use almost identical recipes. Food is reasonable but expensive and one has the impression that the prices have simply been changed to Euros without remembering to divide the amount by two !. 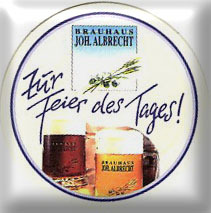 See the Schlachthof Bräu Web Site for further information. A very interesting brewery can be found in the small village of Hörvelsingen which lies north of Ulm. 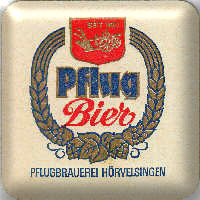 The 300 year old Pflug brewery founded in 1681 is one of the last remaining in Germany which still produces its own ice for cooling instead of using electricity. 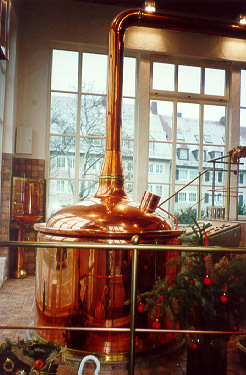 The brewer Fritz Gnann lagers his beer in a 6 by 8 meter cellar at around 0 degrees Celcius and requires 200 cubic meters of ice to last the whole year. 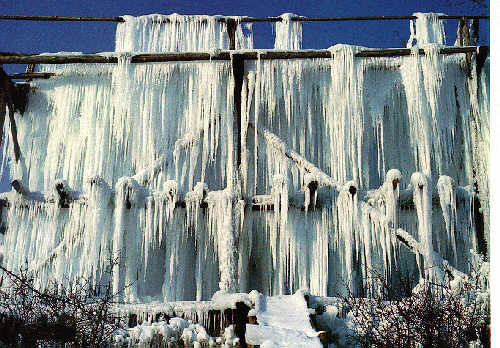 Behind the brewery is a hundred year old structure of pipes and sprays which is opened in winter when the temperature falls below freezing and the ice formed is harvested twice to fill the cellar. 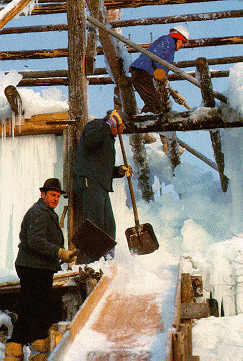 The villagers group together for this hard work and using axes and shovels direct the ice blocks down a wooden slide to the storage area. 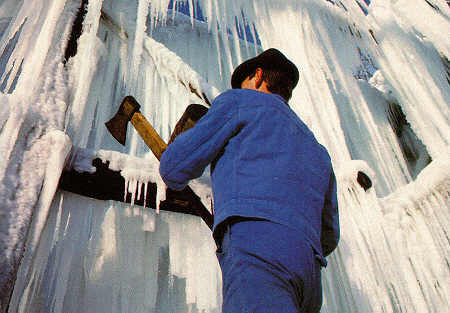 Before this structure was built ice blocks were cut out from a nearby lake and transported by sledge to the brewery. Open daily from 10:00, Closed Wednesday and on Sundays between 12:00 and 15:00, take a trip to this brewery which time forgot while it still exists. Beers Available: Spezial, Dunkel, Pils, Hefe Weizen, Seasonal Specialities: Marzen style Festbier and a nice Helles Bock which they only produce in Winter. Situated on the banks of the river Neckar in Tübingen this building can only be described as an architectural nightmare which is a pity as the area is very nice. 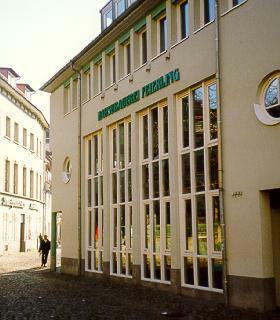 This critic aside, the brewery is called the Tübinger Gasthausbrauerei Neckarmüllerbräu and can be found in the Gartenstrasse 4, Tel: 07071 27848. Open daily from 10:00, it is a friendly brewpub with an outside drinking area where it is possible to watch the rowing boats and punters float by whilst enjoying a drink. They serve a Munich style top fermented Helles Weisse which is very yeasty and slightly tangy, a pale Keller beer which is an average quality export style brew and when visited also a Maibock which was almost exactly like the Helles Weisse only more carbonated and slightly stronger. Not at all how a Maibock should taste and more of a Weizenbock. For food they have a comprehensive menu but still serve Flammkuchen, Kässpätzle plus other snacks which are OK. 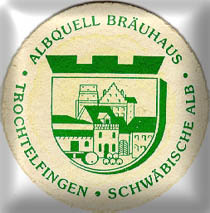 The Albquell Bräuhaus can be found in the lovely old village of Trochtelfingen. 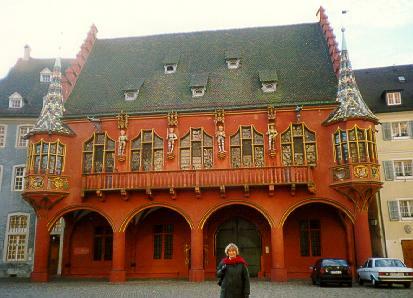 Take a little time to walk around and discover the Fachwerkhäusern (Half timbered houses) some of which were painted with ox blood to give the dark red colouring of the wood. You can also find parts of the old town walls and an interesting old guard tower as well as picturesque scenes where the local stream runs around and sometimes through the old houses. 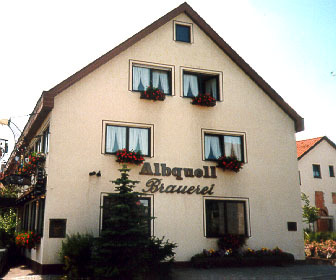 The Albquell brewery pub is run by the Auberger-Schmidt family and can be relatively easily found just off the centre of town Tel: 07124 733. This is a nice comfortable and friendly pub which serves 4 beer sorts, Edelbier, Pils, Urtrunk and Weizen. The Edelbier is a clean tasting clear smooth 5.0% beer which is obviously made from good quality ingredients. Served a little too cold this is nevertheless a good if not exceptional beer of its type. The Urtrunk is in fact a fairly hoppy 5.1% Pils but fails to distinguish itself in any particular way. The only criticism here is the lack of variety between beer sorts, which is a pity as the brewery is obviously quite capable of doing more. The food quality is very good and varied with a particular speciality called 'Kutteln' which is a type of stuffed stomach for those who enjoy such things. The town of Freudenstadt is situated nicely in the black forest and is a good location for walks as well as being interesting for its small shopping arcades around the marketplace which is in fact the largest in Germany. 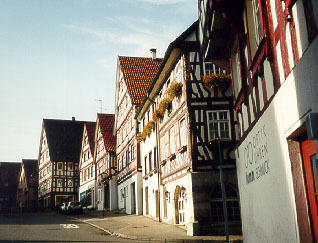 After being destroyed in the Second World War, Freudenstadt was completely rebuilt on the basis of 1599 Renaissance plans. 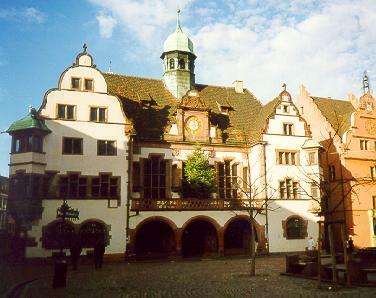 Today, Freudenstadt's restoration is still considered exemplary for post-war reconstruction in Germany. 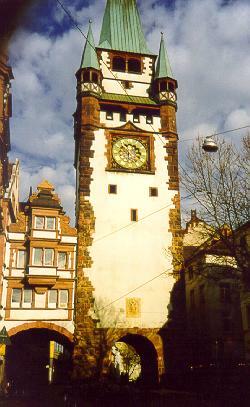 The Turm-Bräu was founded in December 1999 in the old post office building directly in the market square. The full address is: Marktplatz 64, 72250 Freudenstadt, Tel: 07441 905121, Fax: 07441 905122. There are strangely enough no markings outside to identify the brewery but it is relatively easy to find as it is directly in the center of the marketplace and the coppers can be seen from the outside of the building. 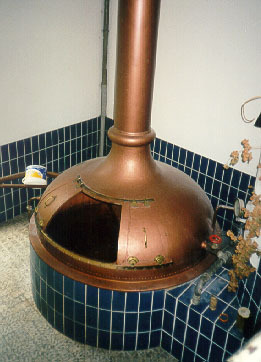 The owners of the Turm-Bräu are Oliver und Matthias Grohe and brewer Peter Herre who learned his trade at the famous Weihenstephan brewery in Bavaria. The brewery interior is tastefully decorated in the style of a skiing chalet with a cosy character and outside there is an unusual heated beergarden for cool summer evenings. Beers available are Pils and Weizen year round as well as seasonal brews. A beer named Adventus is brewed around Christmas which is dark and malty although apparently rather lacking in strength for a winter brew. A stronger brew named TURMinator is supposed to be available at other times but never seem to appear in reality. 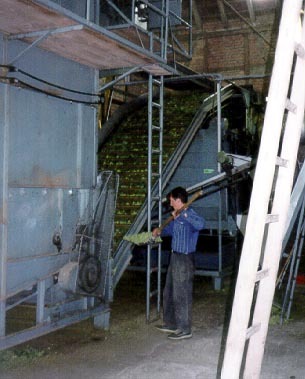 During a last visit in December 2004 we found that the beer quality had unfortunately not improved, particularly the Christmas brew which was very close to undrinkable. We were also very disappointed with the food quality this time. Therefore this brewpub can no longer be recommended until quality improves drastically. 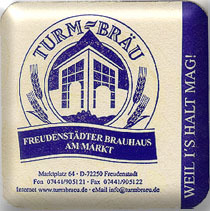 A much improved Local Web Site does exist for the Turm-Bräu. 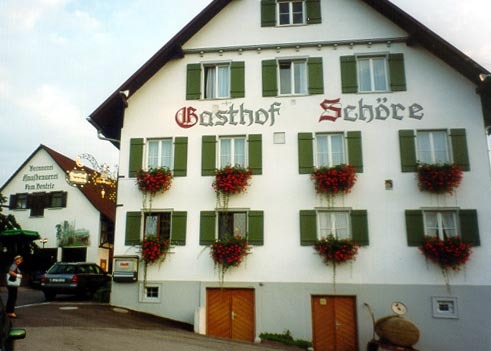 Just outside Tettnang which is world famous for its hops and situated in the tiny village of Dietmannsweiler lies the excellent Gasthof Schöre Tel: 07528 2317 Fax: 07528 2587. Easy to find once you get on the right road this is a place not to be missed as it is outstanding in every respect. Owned by the family Bentele since 1906 the location comprises of a fully operational farm with hop picking and packing outhouses as well as the spotlessly clean brewery. Open Tuesday to Saturday from 16:00, Sundays, public holidays and Saturdays (Only in Summer) all day. Mondays closed. 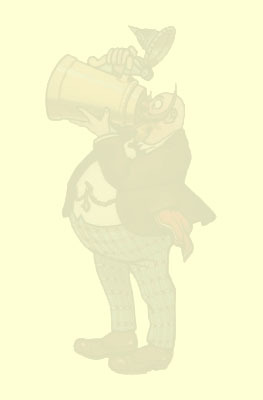 Regular beers include a pale unfiltered Hell which has an almost overpoweringly full hoppy aroma and taste, very moorish and unique. A Dunkel with a dark chocolate colour is also regularly available and this has the same heavy hoppiness as the Hell but with a smooth malty flavour which ends with a slightly dry aftertaste. The quality of these beers cannot be overstated. They are a culmination of the finest ingredients and the best water quality brewed to perfection. As they have their own farm animals the food is also first class and everything can be enjoyed in the Bavarian style guesthouse or in the beergarden where there are facilities for children including pony rides. The brewery also produces a seasonal 17 % Stammwürze Dunkel Bock which is very pleasant although not as exceptional as one might expect given the quality of their "Regular" beers. 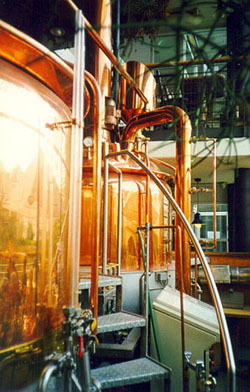 The brewery also produces its own Schnaps. You can find out more from the Gasthof Schöre's informative Website. If you happen to be visiting Tettnang around Mid-March try the Coronator Doppelbock from the Kronen Brauerei, Bärenplatz 7 in the center of Tettnang, Tel: 07542 7452. Ask for it in a "Steinkrug", drink a couple and make sure you don't have too far to walk to the nearest Hotel. 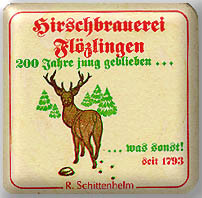 An exceptional beer, but only available for a short time during the "Starkbierzeit". 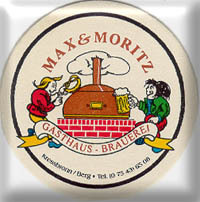 The Gasthaus Brauerei Max & Moritz is nicely located on a hill overlooking the Bodensee and is particularly well worth a visit in Summer to relax in the beergarden. 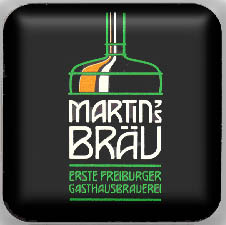 The full address is 88079 Kressbronn Berg, Tel: 07543 6508, Fax: 07543 5742 and the brewery is open every day from 10:30. The best regularly available beer is the Spezial Dunkles which is smooth and has a sweetish aftertaste, an ideal beer for sipping in warm weather. 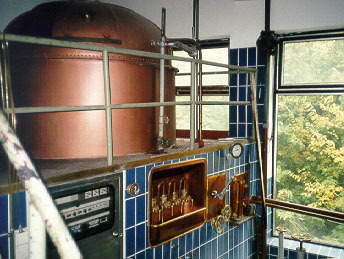 The brewery also produces Pils and Weizen as well as a strong Bock called Maximator which is available around the middle of February. 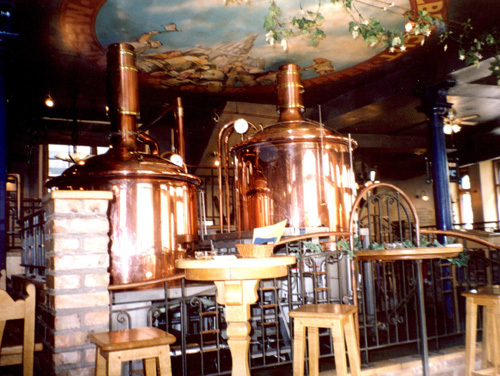 Live music on weekends and regular Beer Seminars are also a feature of this brewpub. If you are lucky you might even get to see a Zeppelin flying by over the Bodensee. See the Max & Moritz Website for further details. 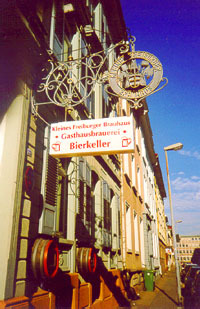 Right in the heart of the old town, the Brauhaus Joh. 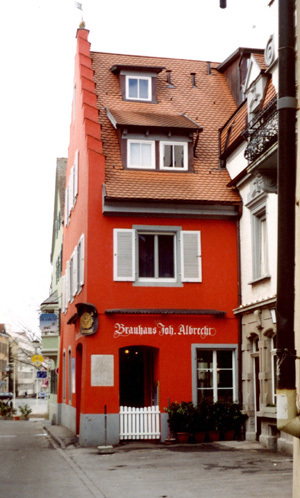 Albrecht is one of 6 breweries belonging to this group stretching from Hamburg in the north to this one in Konstanz which can be found at the following address: Konradigasse 2, 78462 Konstanz, Tel: 07531 25045, Fax: 07531 27886. The brewpub is open every day from 11:00 to 01:00 and serves 2 types of beer year round as well as an occasional stronger Bock. The 2 main beers are Kupfer(Copper) which is a very pleasant malty Dunkles and Messing(Brass) which is a hoppy refreshing Helles. 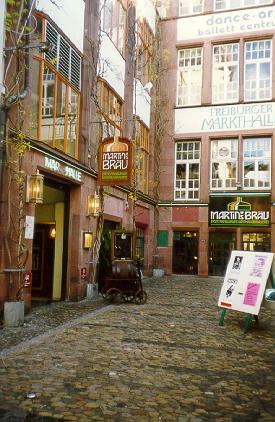 In Konstanz it is well worth making a visit around the middle of March when a special "Fastenbier" is brewed, also known as Nickel which is available in some of the other Joh. Albrecht pubs around Christmas time. 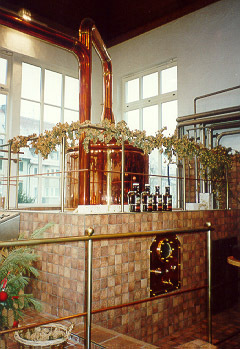 In Konstanz the brewing of this special beer coincides with the "Starkbierzeit" which is celebrated by Bock and Doppelbock beers from many breweries across Bavaria. This slightly cloudy dark beer has a mild spicy aroma and a very smooth malty taste with a slight hint of pear drops in the aftertaste. Overall the smoothness of this beer is particularly impressive showing the quality of the ingredients and water used by a skilled brewer. Highly drinkable. See their own Website for further details. 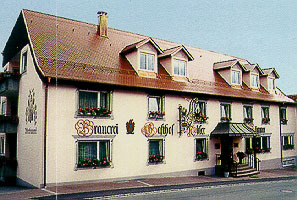 The Brauereigasthof Adler can be found in the very small village of Hundersingen Tel: 07586 378 Fax: 07586 5360. Recently renovated and run by the Bischofberger family this pub is very pleasant and if you are looking for a place to stay the night as well, look no further. The beers available are Spezial, Pils and Zwickelbier but unfortunately no seasonal beers. The Spezial and Pils are both quite similar with a strong perfumy aroma which most closely resembles vanilla. 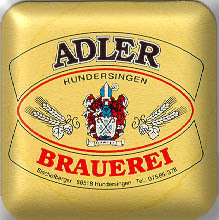 Both beer use Hallertal hops and have a very smooth taste and the soft water makes the beer seem quite sweet which is rather unusual for a Pils type beer. The Spezial is perhaps the more enjoyable of the two and is certainly very drinkable. The Zwickelbier is a slightly cloudy unfiltered version of the above but lacks any special character. 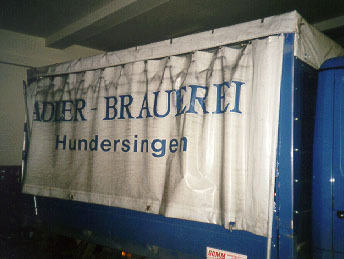 The brewery at the back of the building appeared not to be in use at the moment and it is not clear that the beers are actually from Hundersingen. 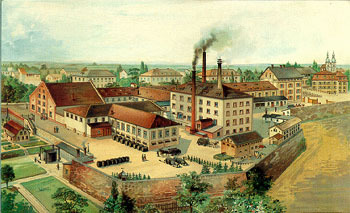 Officially the listing of the brewery is 'Adlerbrauerei Anton Bischofberger' at Ortstrasse 1 in the nearby village of Herbertingen. The owner did not wish to make it clear whether the beers are actually still brewed on the premises, so be warned. Now has a Website but beers are probably brewed in another location. 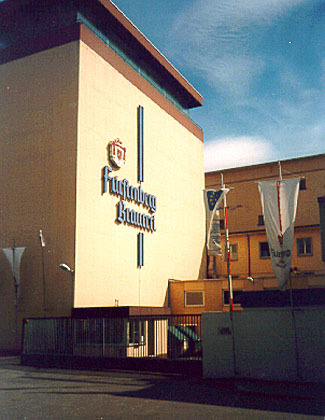 This now very large brewery started in 1705 by Anton Egon Fürst of Fürstenberg is still in its original location in the attractive town of Donaueschingen. They claim to have introduced the first Pilsner style beer into Germany in 1895 when brewmaster Josef Munz produced a beer named "Bohemia". Apparently this beer was very popular with the then king Wilhelm II and in 1905 was his majesty's favourite table drink. 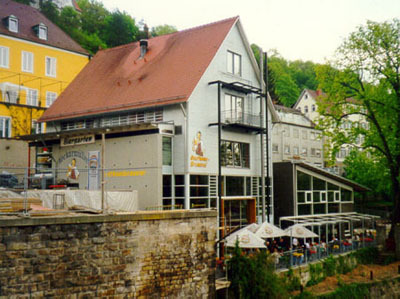 The best place to try the beers is in the Fürstenberg Bräustüble run by Peter Huhn, Postplatz 1-4, 78166 Donaueschingen, Tel: 0771/ 36 69, Fax: 0771/ 863 98. Ask for the premium Pils in a stone mug (DM 4.50) to try it at its best and try some of the food specialities such as: Schwarzwälder Grünkernsüpple, Badischem Zwiebelbraten or Leberknödle and Schäufele auf Kraut. 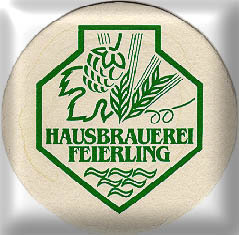 The beer range includes: Fürstenberg Premium Pilsener, Fürstenberg Export, Fürstenberg Kristallweizen, Fürstenberg Hefeweizen - hell, Fürstenberg Hefeweizen - dunkel, Fürstenberg Festbier, Fürstenberg Fasnetbier as well as Bären Pilsner and Bären Dark from a take-over of the Bären brewery. The Bräustüble is open every day except wednesday from 11:00. More information can be obtained from their own Local Web Site. 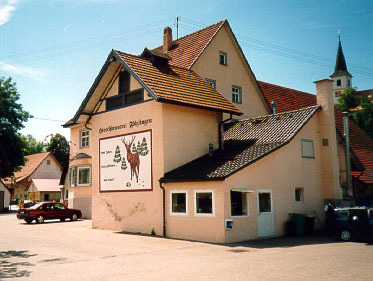 The over 200 year old Hirschbrauerei founded in 1793 is claimed to be Germanys smallest commercial brewery and can be found in the small village of Flözlingen. The exact address is Gasthof zum Hirsch, Eschachstraße 15, 78658 Flözlingen bei Rottweil, Tel: (0 74 03) 4 89 Fax: (0 74 03) 75 44. Open from 11:00 Wednesday to Friday and from 10:00 weekends and holidays, the Hirschbrauerei is closed on Mondays and Tuesdays. A pleasant and friendly welcome awaits those who find their way here and the owner Rolf Schittenhelm is proud to discuss his profession along with the varied opinions of the locals. Beers available are the Hirsch Spezial and seasonal 6.5% Alc. dark Bock as well as an unfiltered Spezial. 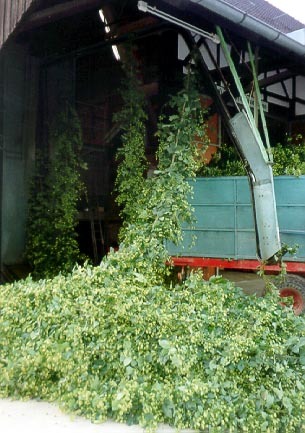 The main house beer is lagered for 6 to 8 weeks at 0 to 2 degrees centigrade. 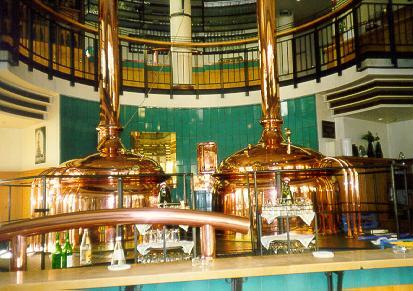 The brewery also produces a couple of different spirits from their beer, namely Hopfentröpfle and Bockbierlikör. 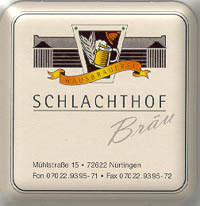 Further information can be found at the Hirschbrauerei Web Site . 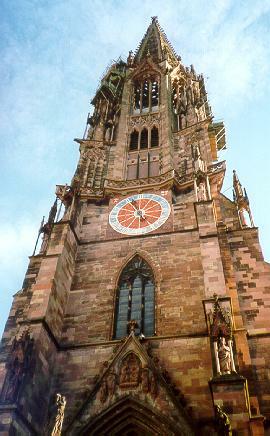 Freiburg is a beautiful city full of history and well worth a visit. 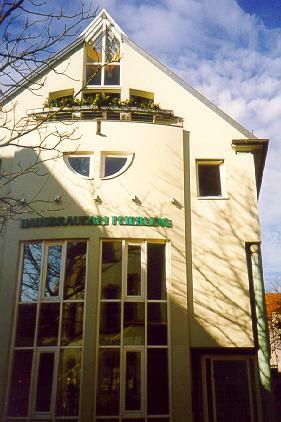 A brewery since 1877 which moved to new premises in 1989 the Hausbrauerei Feierling is centrally located on Gerberau 46 and is open every day Tel: 0761 243480. Spanning three floors the pub can get very busy on the weekend especially when they have live music, so be prepared to wait for a seat. They only have one beer on tap which is a Pils type called "Inselhopf" but it is a very fine example indeed. The beer has a pale colour and is unfiltered, it is very hoppy, refreshing and slightly bitter with a stammwurz of 13°. It undergoes 6 days main fermentation followed by 3 to 4 weeks lagering. Simple good food is available with particularly tasty Black Forest ham on the menu. See the brewery Web Site for more information. 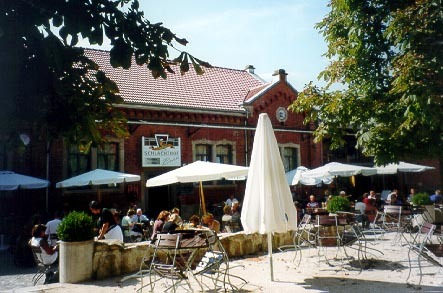 Situated near to the main station the pub can be found in the Moltkestrasse. Closed on Sundays the beers available include a Roggenbier (Rye) amongst others. Latest News. It is not clear whether they brew anymore. Also very busy in the evenings the main beer type is a Pils which is much drier than the beer of Feierling and slightly disappointing in not having much of its own character. Still with good food available and a jovial atmosphere it is well worth a visit.